The ICD-10-CM & OASIS Field Guide, 2019 contains two important references for clinicians on the go — a quick ICD-10 code look-up and a guide to answering the OASIS case-mix questions. 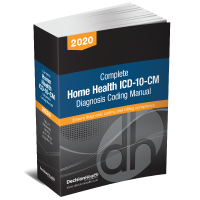 Section I: ICD-10-CM Field Guide provides official guidance on how to assign the most often-used home health ICD-10 codes. It contains Tabular rules such as Includes and Excludes notes, and provides case-mix and supply booster information. Section II: OASIS Field Guide provides the most up-to-date CMS guidance on how to accurately answer the OASIS-D case-mix questions. We’ve taken CMS’ most recent guidance and boiled it down to plain-English tips that clinicians can quickly turn to when filling out an OASIS form. New: Updated with FY2019 code changes and latest CMS OASIS-D guidance updates so that you have the most recent information to code accurately. Icons identify the new and revised codes. New: FY2019 tabular and index updates most applicable to home health clinicians and coders on the go who need to do a quick code check. New: Updated coding guidance and key official guidelines and tips embedded at the code level to help you quickly navigate the new coding rules to accurately assign the correct ICD-10 codes. Icons assigned to manifestation diagnoses to alert you that these codes require an etiology or they will be denied. New: Updated with ICD-10 case-mix, case-mix manifestation and supply booster information: New case-mix and supply booster codes delineated with the appropriate icons to bring your attention to the codes that are the most resource-intensive and therefore impact your reimbursement. 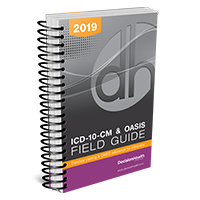 The 2019 ICD-10-CM & OASIS Field Guide is meant to make your job easier. Take it with you to every OASIS visit and use it as a guide to selecting the initial ICD-10 codes and answering the OASIS case-mix questions.